During the recent updating of the plumbing for the Locke Tavern the floor between the first and second stories behind the center chimney was removed. * Modern plumbing running next to the chimney stack to the left as we expected. * A diagonal beam with stud framing below and above that do not match up - ie: the beam was there before the framing. * A door opening into the nw bedroom - the white angle on the right. The diagonal beam is the beam for the original roof over the back wing . On the top edge of the beam you can see where the purlins were let in. Over that would have been laid the sheathing and then wood roof shingles. The Locke Tavern once had a lean-to back wing. The space was served by a third fireplace set against the chimney block. This house shape is referred to as a 'salt box'. Sometimes these wings were added later, the new roof laid over the existing one, often at a slightly different angle. I have not yet seen how these 2 roofs join. For readers who don't know about the form: Here is a picture of a saltbox c. 1715: the John Kimball House in Ipswich Mass. The name was applied to this way of extending a house much later, in the 1890's. It comes from the shape of a kitchen salt box of that period. Another name for this roof configuration is a "cat slide". I chose this house as an example because Kimballs also lived in Andover, Mass. The picture comes from the HABS archives. This means the northwest wing was extended and a second floor added over the lean-to when the house was enlarged and updated around 1790. How was the size of the lean-to determined? I think the master carpenter used the geometry of the square and the Golden Section just as he did for the main house. In the diagram the lean-to is outlined in black (a). The square and its diagonal extended (the Golden Section) determine both the left and right sides (b). The center section (c) is more problematic. I wish I had been able to photograph and measure it on site when it was open. The drawings I am using are of the house before it was opened up. Clearly the framing extends on each side of the chimney block with the kitchen fireplace set in between. There are posts in the outside wall and posts on each side of the chimney, at the back corners of the front rooms. Maybe the shape is a rectangle that has sides determined by the 3-4-5 triangle. But I don't know precisely. 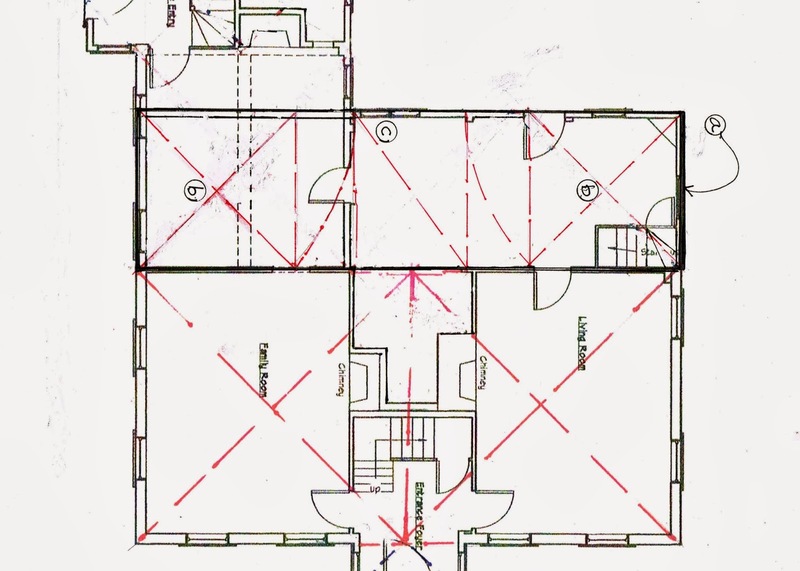 It would have been so easy if the basic floor plan were a 3-4-5 triangle! But it isn't. The house measures 36 ft x 28 ft.